Located at the southwestern tip of Brooklyn, family-friendly Bay Ridge is known for its affordable housing, diverse community and incredible places to eat and play. 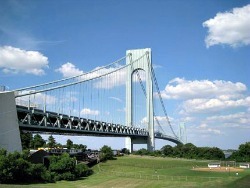 Its two waterside green spaces, Owl's Head Park and Shore Road Park, boast amazing views of Staten Island, the Verrazano-Narrows Bridge, New York Bay and lower Manhattan. Plus you'll find lots of cute little playgrounds nestled on side streets, alongside quaint houses and old-school ma-and-pa businesses like authentic New York City soda fountain Mike's Hisch's and family-owned play space Play Days & Parties. Whether you're a local looking for things to do in your neighborhood or visiting for the day, we hope our guide to Bay Ridge helps you uncover the very best things to do, experience and check out with kids in the area.